At Long Last, Spring Series Racing Starts! After a couple of weeks of frustrating weather we finally got the chance to go racing this past Sunday! We had a great turnout this past Sunday with 3 Multi-Hulls, 6 Albacores, 2 Bucaneers, and 9 Lightnings (with 3 more represented on the RC for a total of 12!). I was PRO for the day (with Bob Gotthardt and Lisa-Marie Lane rounding out the RC). All I can say is that it was a very goofy day, with “east” winds varying wildly in velocity and direction all day long. We saw the breeze swing from 35 degrees to 115 degrees and back in just a minute or two. There was more than one instance of a breeze directly out of the south settling over the course for a few minutes, before reverting back to an easterly. Given the wind direction the O2 courses were short, but they were surely challenging for the sailors given the shifty and puffy conditions. We were able to get 5 (!) races in before sending the boats back to shore to enjoy the PRSA season-opening BBQ. Here are the results! Spring Series Starts in 2 Weeks! Serving as PRO or Regatta Chair (rows highlighted in orange on the spreadsheet) count as two slots given the extra organizational responsibility for these roles. As we get into the season I will send out a reminder and some additional instructions to each PRO a few days prior to the weekend/event for which they are signed up. Sign up now so that you know you have your dates reserved, and so that we don’t have to scramble week-to-week to find RC. As always, please don’t hesitate to let me know if you have any questions. PRSA Membership Dues are Due Now! Just a reminder that PRSA Membership Dues are due by Jan. 15! Please join or renew via the link on the “Dues & RC Duty” page if you haven’t already done so in order to avoid a late fee. Pay now and you’re all set for the season! 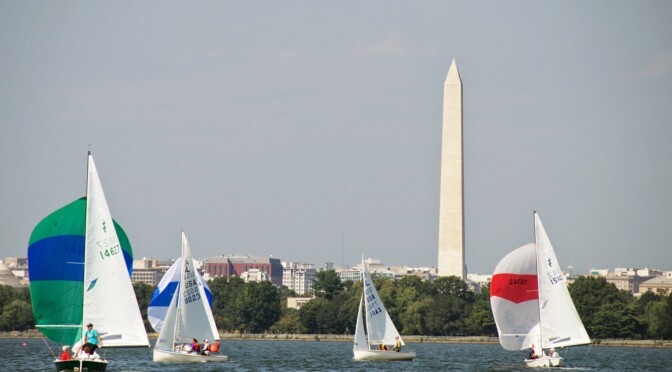 PRSA Dinghy Open — All Classes, All Boats, One Winner! We held the Fall PRSA Dinghy Open on Sunday, 15 October. With 7 Lightnings, 2 Buccaneers, 2 Albacores, and 1 WETA we had a nice mix of classes on the course. PRO Bob Bear and his RC Crew did a nice job in setting up 4 fantastic races (an O2 and 3 O3 races) in a steady S/SW 10-15 knot breeze. It was a fantastic chance for all of us in various classes to square up against one another on one start line and on the same course! Instead of presenting a writeup from just one person, I’ve asked all of the skippers and crews to send in a line or two describing what they saw on the course, what they were thinking about, or what they learned. I’ve started the thread with the first few contributions here. Please feel free to add your own thoughts as comments, or email them to Aaron to have them added to the main post. Scores are posted here, but keep reading for some of the fun details and observations from the weekend! From Nic and Connor on their Buc: Connor and I, after getting in the mixing bowl with everyone else for the start of Race 1, decided, for races 2 and 3, to hang 10-20 yards below the starting line, going across on starboard from midway of the line at about the 1 minute horn. Then we slowly headed up with the goal of starting right at the pin at full speed. And it worked! We were leeward to everyone as we got to the line and so had a great position and got 2 really good, fast and clear starts (before our jib issues half way through race 3 led to us going in). Also, at BNAC we learned how to use the spinnaker pole to wing out our jib on the downwind legs when wind speeds made us a little nervous to fly the spinnaker. Winging it out lets you sail right at the mark and to take advantage of any surfing possibilities that come up when you’re going directly with the waves . I think that we were as fast, maybe ever faster, to the mark (VMG) as most boats around us. We put the pole on the jib sheet and then lower the pole to stretch out the jib to expose as much surface area as possible. From Aaron, sailing with Dana and Blake on Aaron’s Lightning: from the beginning we thought that the right side of the course would be favored (having observed some wind shifts at the line and the puffs along the airport shore). Contrary to Nic’s strategy described above, we made a point of fighting for a boat-end start for each race. It paid off for us — we were either off the line and leading early, or we had the room to tack right and then tack back to go south. We gained each time we went right, though we had to be careful. There was a nice righty (lift on starboard tack) as you approached the windward mark each time. At the same time, you could make nice gains by staying middle or a bit left after rounding the leeward mark. It was most important to get right in the upper 1/2 to 1/3 of the windward leg. Beyond that, we focused on boat balance. Sailing a Lightning flat (windward chine just barely out of the water) is very, very important. When we did this well we could point 3-5 degrees higher than our competition and still keep our speed. Doing this off of the start allowed us to hold lanes against Albacores and Bucs, and to pinch off boats to windward. Flat is fast!!! The combination of low tide, hydrilla, and light air made it difficult to get to the course. Once there, is was easier but the light air and winds that came in from the east, the west, the north, and often privately provided to a small group of sailors made it particularly challenging. Here is the writeup on PRSA Fall Series #3 from John Van Voorhis in the Lightning Fleet. Scores and more info are posted below. Kudos to John and David for taking 1st on the day in the Lightnings with three well-earned 2nd place finishes! Thanks to Jim Graham for stepping up yet again to do RC along with Barney Harris, John Hart, and Steve Young. Thanks to Tom Hutton for doing our scores every week. PRSA President’s Cup: Light Winds Didn’t Stop Us From Having Fun! It turned out to be a great regatta with good fun had by all. Keep reading for some of my observations from aboard Lightning #14592 and, by all means, please add your own observations as comments on this post! Scores are here and you can view the great photos from Lindsay Bach here.